Although the value of the contents of an average garage in Britain is £3,429, over two thirds of households with more than two cars choose not to keep a car in their garage. Even though the vehicle is probably worth nearly four times as much. These are the findings of a recent article from Aviva, which highlights that people have a tendancy to keep their DIY materials, tools and gardening equipment in their garage. But it may be more of a case that we just don’t find the time to clear out our garages and keep them tidy – if we did maybe we would fit it all in! Nearly a fifth of households polled still stored unwanted boxes from their last house move in their garage, and although 38% said they would clear out their garage once a year, one in ten said they would never clear it out. 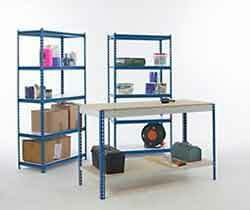 You can get a whole range of workshop benches and shelving units as well as other storage solutions for your garage from Screwfix. On our way to Harrogate!! !